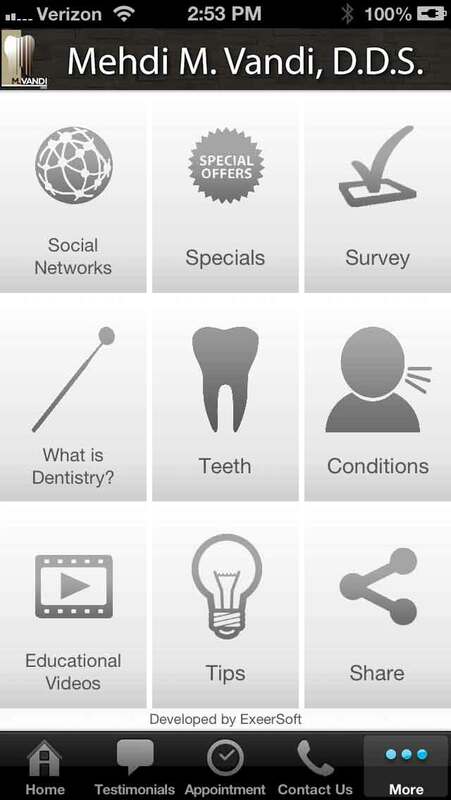 This app is the result of nearly one year of research on the app market, including meetings with dentists, and patients. 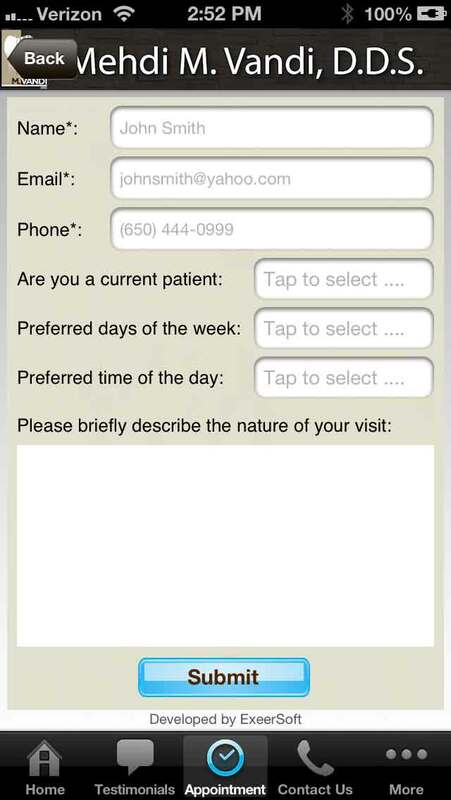 This user-friendly app is the best tool for communicating with your patients. This app not only has your full content information, but also many ways for you to promote your business by providing options such as "Tell a Friend", instant access to Facebook, Twitter, Yelp, and other social network accounts for users to “like” your page and share it with others. 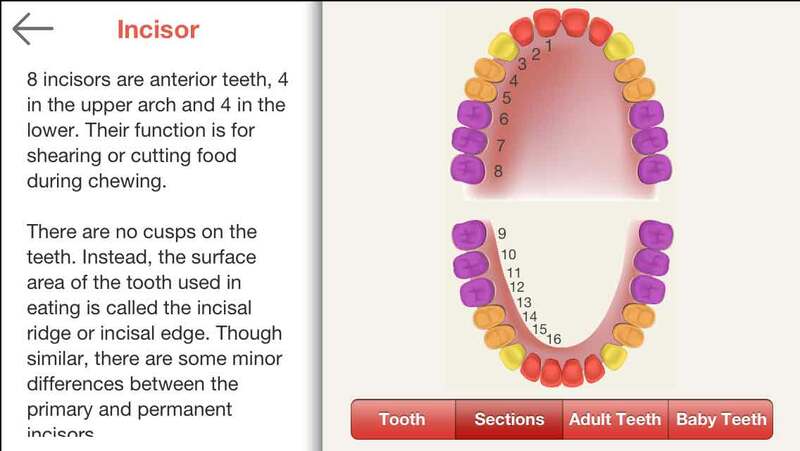 This app is designed to increase your patient's knowledge about dentistry through fun and interactive features such as the "Teeth" page where they can learn about the structure of the teeth, and the arrangment and functionality of each tooth. The Educational Videos are another great way for them to learn about dental procedures and how to keep their smiles healthy. They can also explore more on the “Conditions” page. This app would be your greatest gift to your patients and a powerful tool for instant communication with them through the “Push Notification Messages” (read more below). This app also enables your clients to write a testimonial or record a video testimonial right from inside the app and send it to the email address of your choice. 1. Surveys help you improve your business. 2. It shows your clients that their opinions are important to you and you are willing to improve. In other words it shows that you care! To learn more about the rest of the features of this great app and get the details, please read the Features section below. Through this feature you can instantly send an unlimited number of messages every month to your patients. 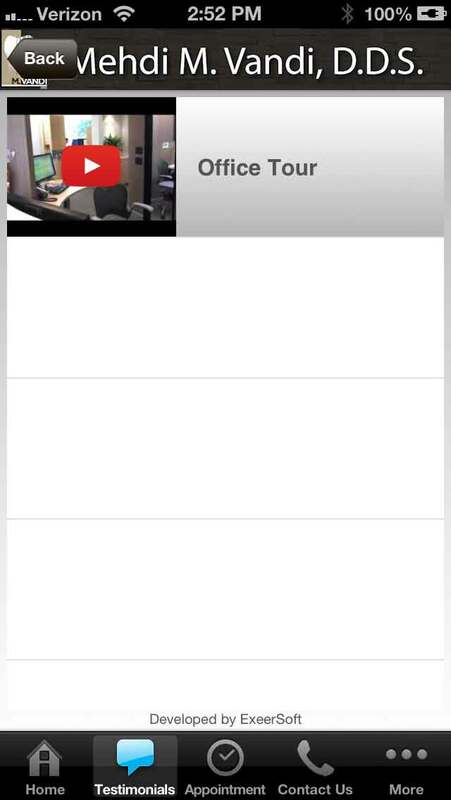 This feature can be used to broadcast your Special offers, events, or any other messages. A customized icon in the color of your choice that includes your business name and logo. A customized top banner in the color of your choice that includes your business name and logo. 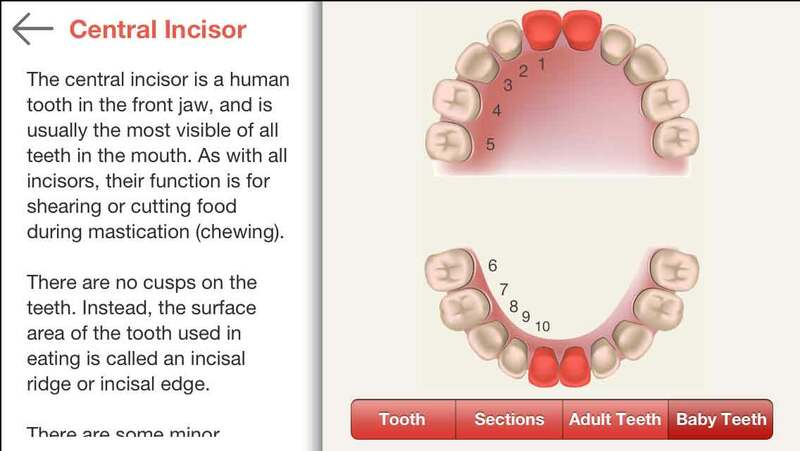 This is a unique and extraordinary feature for your patients to learn about the tooth sections and the functionality of their teeth. 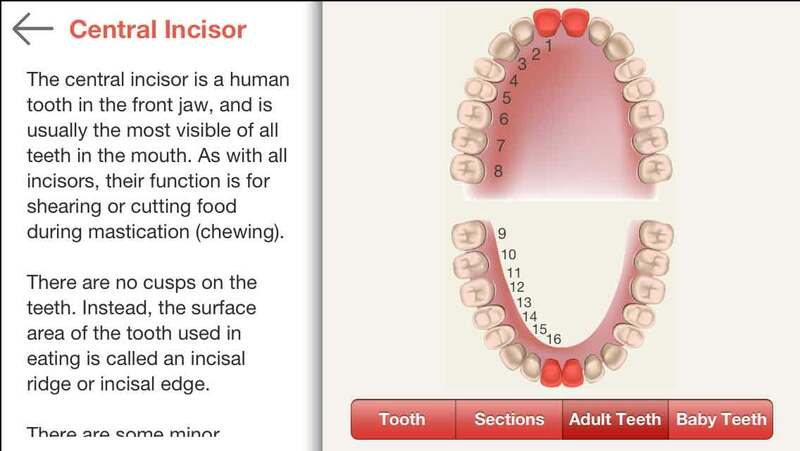 This is the only dental app on the market with this great feature and it takes patient education to a whole new level. 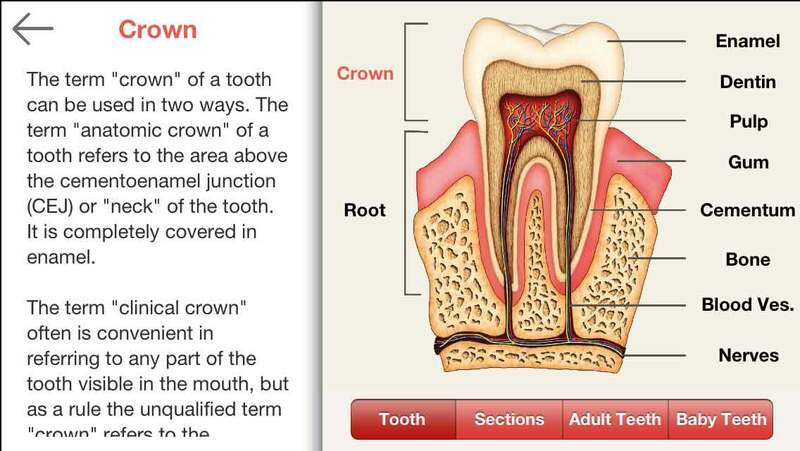 Many articles and educational videos about dentistry, patient conditions, dental operations, and teeth. 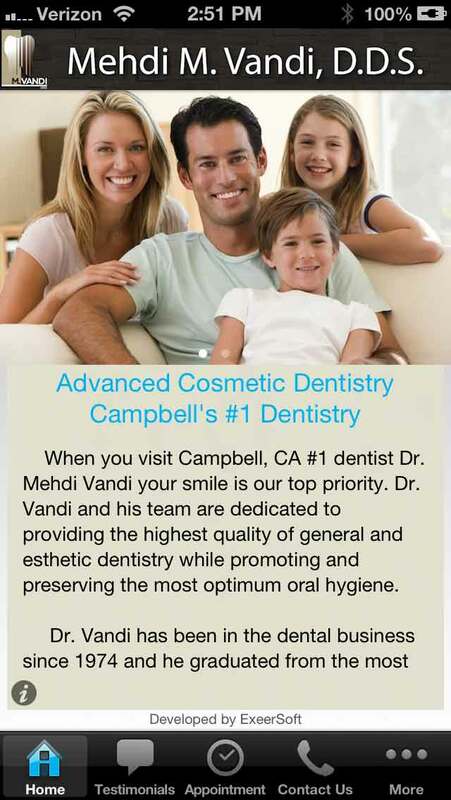 Home, Testimonials, Appointment, Contact Us, and More pages. 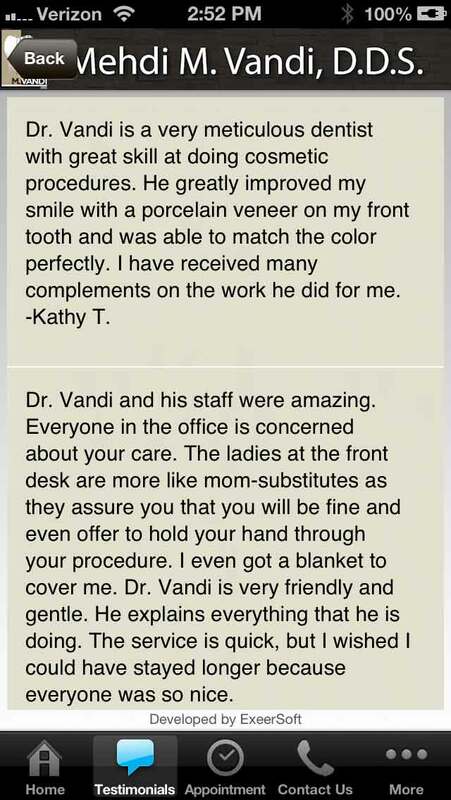 Video Testimonials, Written Testimonials, Submit Testimonial, Specials and Tell a Friend, website, Dentistry, Teeth, Conditions, Educational Videos, Tips, Request an Appointment, Reschedule an Appointment, Survey and Contact forms pages. Get this app even more customized by choosing three pictures of your choice and the introduction text. 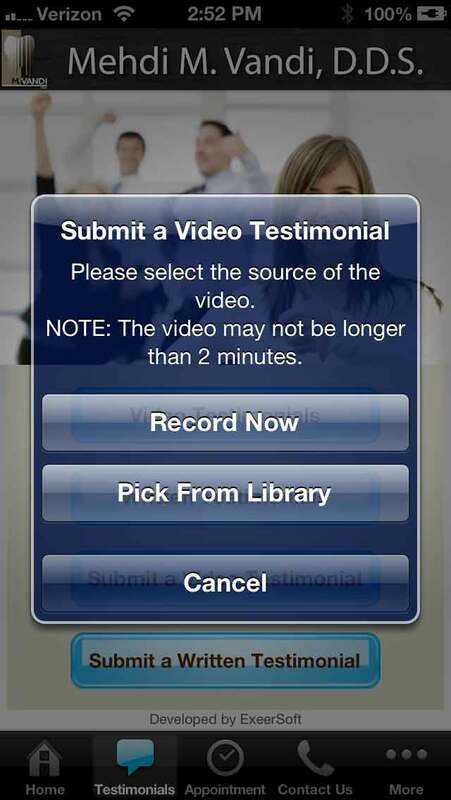 Through this app your clients can record a video testimonial or write about their experience and submit it to the email address of your choice. 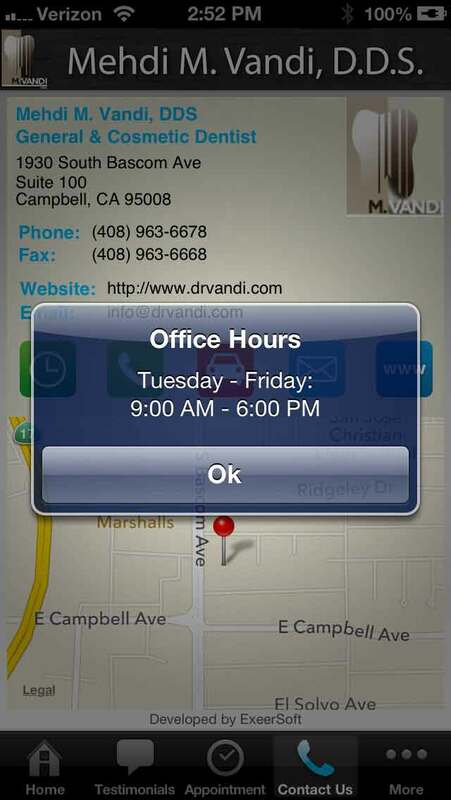 The app includes the following forms: Contact Form, Survey, Request an Appointment, and Reschedule an Appointment. 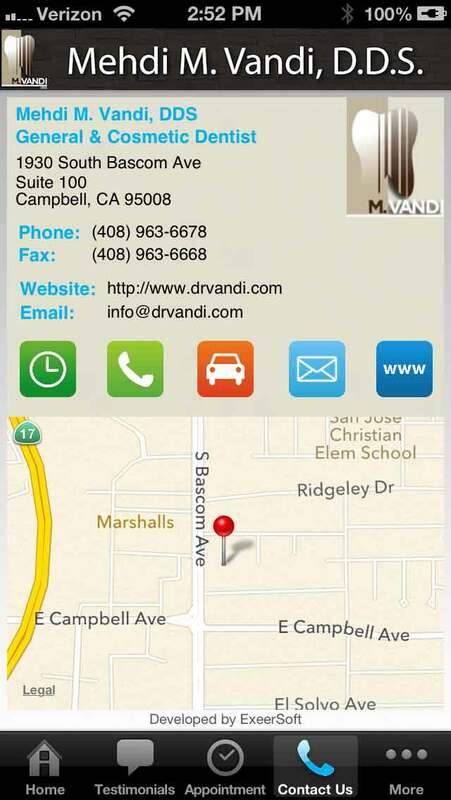 Your business address, direction, map, phone and fax numbers, website, email address, hours, access to your website, send an email from the app, and instant call with click of a button. Access to your Facebook, Twitter, Yelp, Google Places, Yahoo Locals, and/or LinkedIn pages to get your clients to write reviews or like your page. You can include a coupon on your promotion page that your clients can email to their friends or family or use for themselves. 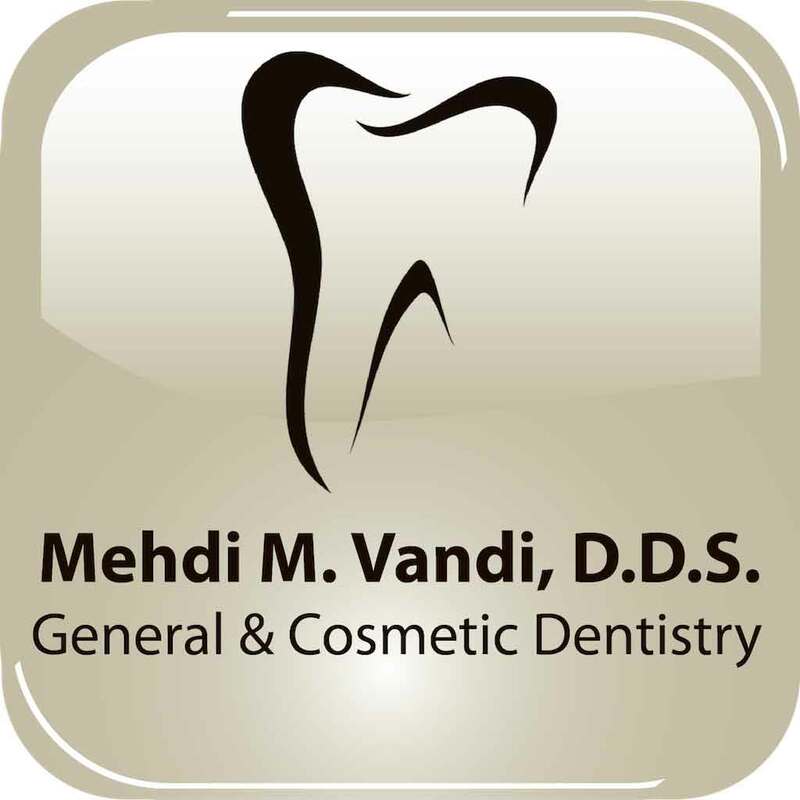 Monthly dental tips about keeping a healthy smile. Option to share the app through Facebook, Twitter, email, or text message. You may request changes on your application every month. Click here to learn more. Supports both Retina 4 (wide-screen, such as the new iPhone 5 or the new iPod Touch) and Retina 3.5 (such as iPhone 4s and previous generations) Devices. Also works on iPad and iPad mini. 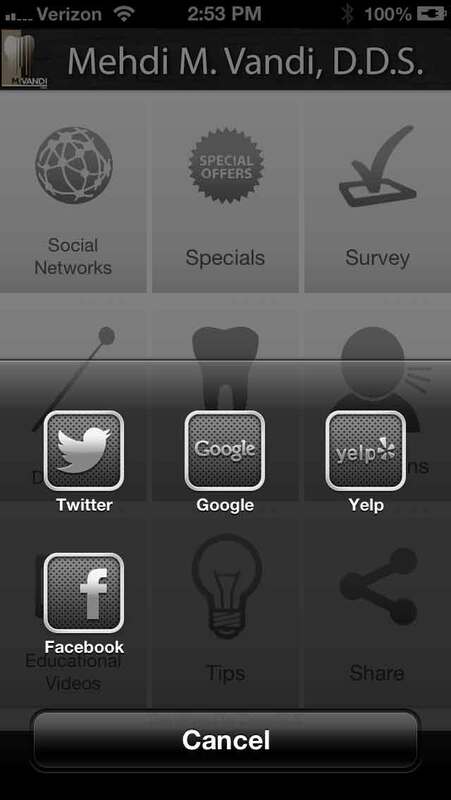 Works on any iOS device (iPhone, iPad, or iPod) with iOS 5.0 or later (which is nearly any iDevice). 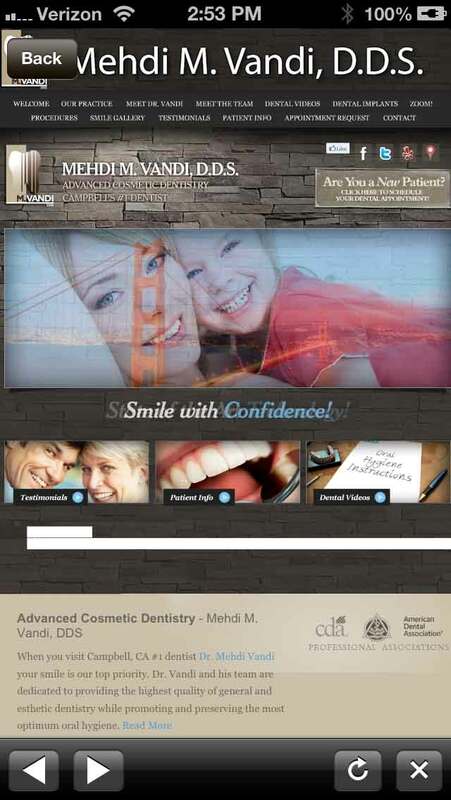 The first page of the application contains three professional photos of your choice that rotate on top of the page, your business slogan, and an introduction to your business. 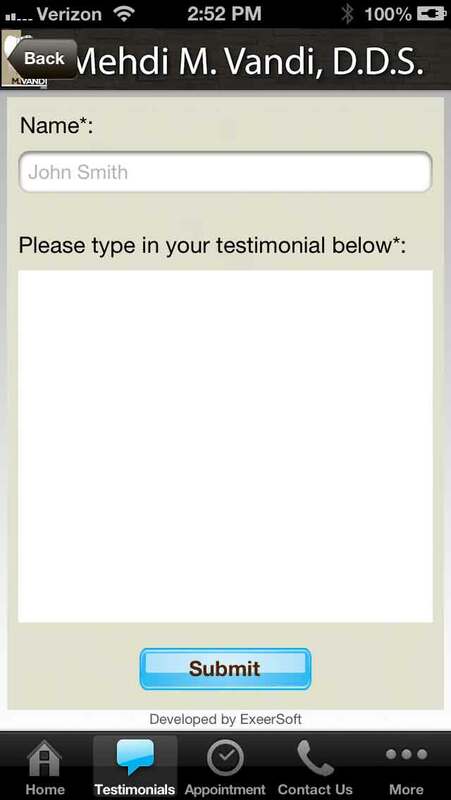 Includes a form where your clients can write and submit a testimonial. With this form, your clients can request an appointment for certain days and times. 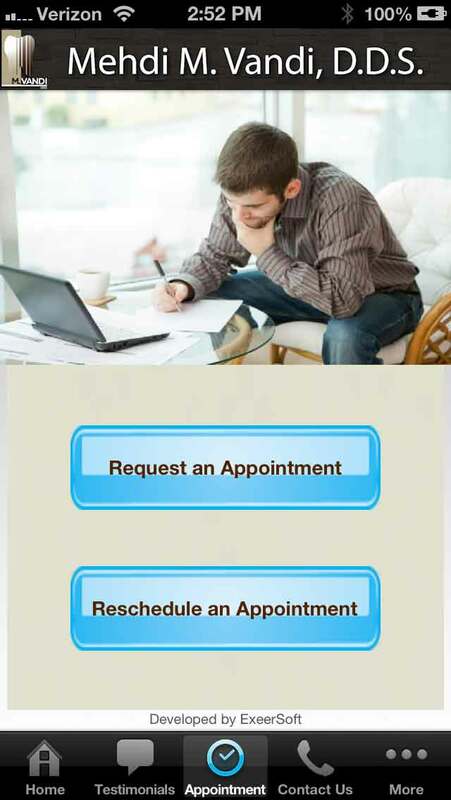 Using this form, your clients can cancel their existing appointment and ask for a new appointment. Using this form your clients can ask questions or send comments. 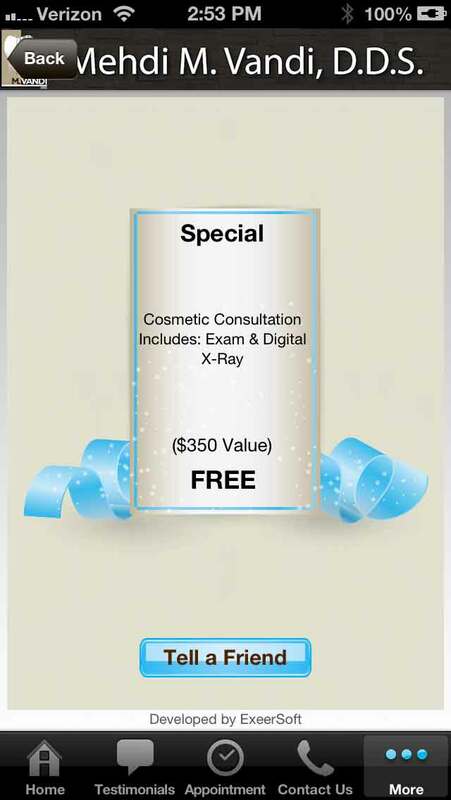 This page includes your current special or coupon which can be used by the patient or they can email it to friends and family by clicking on the "Tell a Friend" button at the bottom of the page. The email will include your coupon along with your business name, address, and phone number. Includes four customized questions of your choosing and a general comments section. 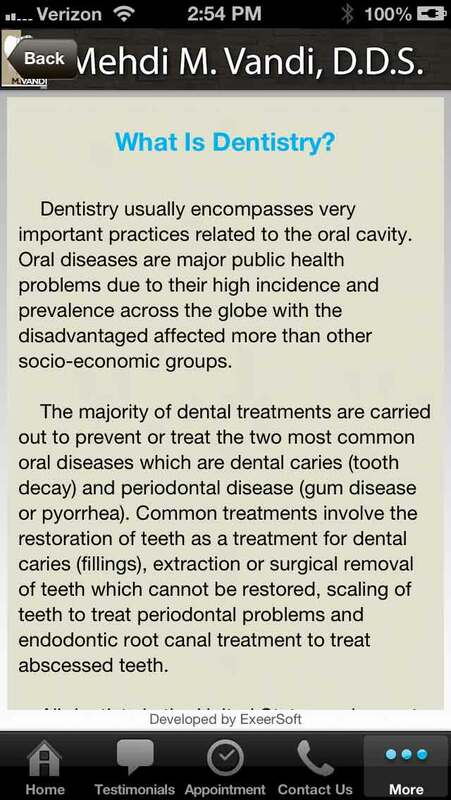 An article about dentistry and dental care. 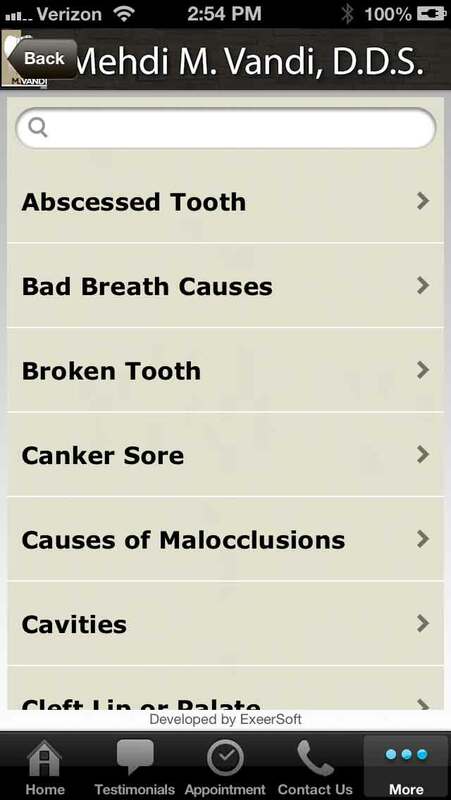 Many articles about dental conditions, their causes, and prevention methods. 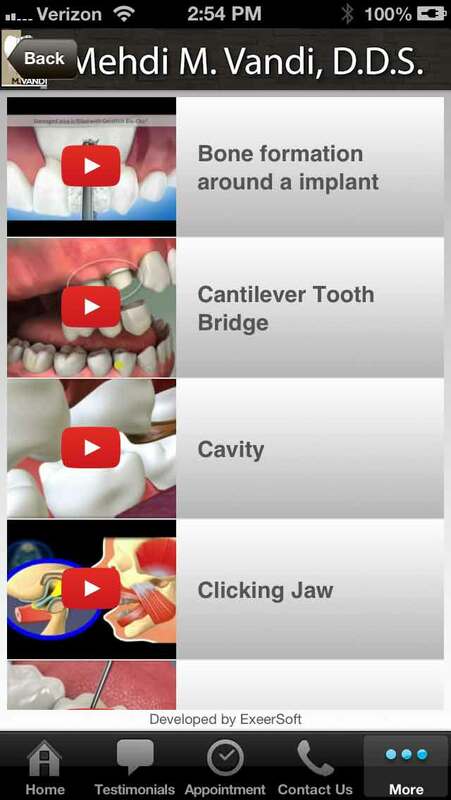 Videos about dental care, conditions, and procedures. 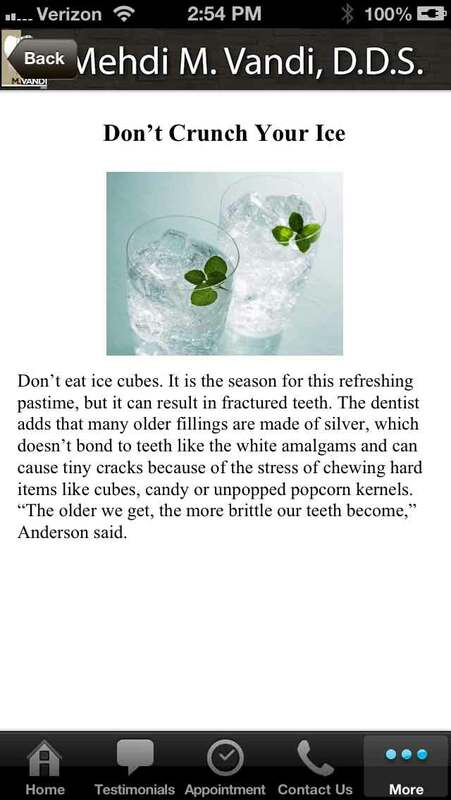 Monthly dental tips for your patients.